In addition to an outdoor pool, Hilton Pasadena provides a spa tub and a 24-hour fitness center. The hotel offers a restaurant and a coffee shop/café. A bar/lounge is on site where guests can unwind with a drink. Public areas are equipped with wireless Internet access (surcharge). A business center is on site at this 4-star property. This business-friendly hotel also offers a vending machine, multilingual staff, and concierge services. A complimentary area shuttle within 2 miles is available for guests. Onsite parking is available (surcharge). A total renovation of this property was completed in December 2017. 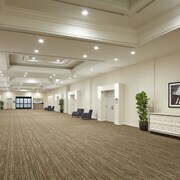 Hilton Pasadena is a smoke-free property. Located in the heart of Pasadena, this hotel is within 1 mi (2 km) of Pasadena Museum of California Art, Pasadena Convention Center, and Norton Simon Museum. Rose Bowl Stadium and California Institute of Technology are also within 3 mi (5 km). Along with a restaurant, this smoke-free hotel has an outdoor pool and a 24-hour fitness center. An area shuttle is free. Additionally, a bar/lounge, a coffee shop/café, and a spa tub are onsite. All 296 rooms offer comforts like pillowtop beds and premium bedding, plus WiFi and MP3 docks. Guests will also find wired Internet, flat-screen TVs, and room service. 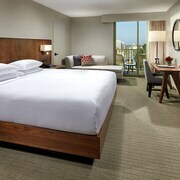 Hilton Pasadena offers 296 air-conditioned accommodations with MP3 docking stations and laptop-compatible safes. Pillowtop beds feature down comforters and premium bedding. 42-inch flat-screen televisions come with pay movies. Rooms have partially open bathrooms. Bathrooms include shower/tub combinations, complimentary toiletries, and hair dryers. In-room wired and wireless Internet access is available for a surcharge. Business-friendly amenities include complimentary weekday newspapers, safes, and phones. Additionally, rooms include coffee/tea makers and irons/ironing boards. Refrigerators and hypo-allergenic bedding can be requested. A nightly turndown service is provided and housekeeping is offered daily. Trevo's - American cuisine with California influences, including pastas, seafood, and steak. Buffet breakfast (surcharge), lunch, and dinner (no dinner on Sundays). Sports Edition - Sports-themed bar with multiple TVs tuned to sporting events. Bar menu and cocktails. Open early afternoon to late evening. Room service - Available early morning to late evening.